Our pal in Doom, Petar, has provided a link on his Doompedia site to a blog known as Dangermart. Martin Gray, the proprietor of Dangermart has a call to arms of sorts for DP fans everywhere. You can check it out via Doompedia or right here. 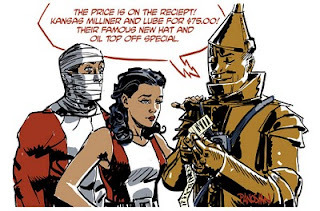 Our friend in all things Doom Patrol and curator of the DOOMPEDIA, Petar, started a petition to save the Doom Patrol, and effectively, Keith Giffen's life as well. Here's a link to the petition. Here's a link to Petar's entry on Doompedia about said petition. 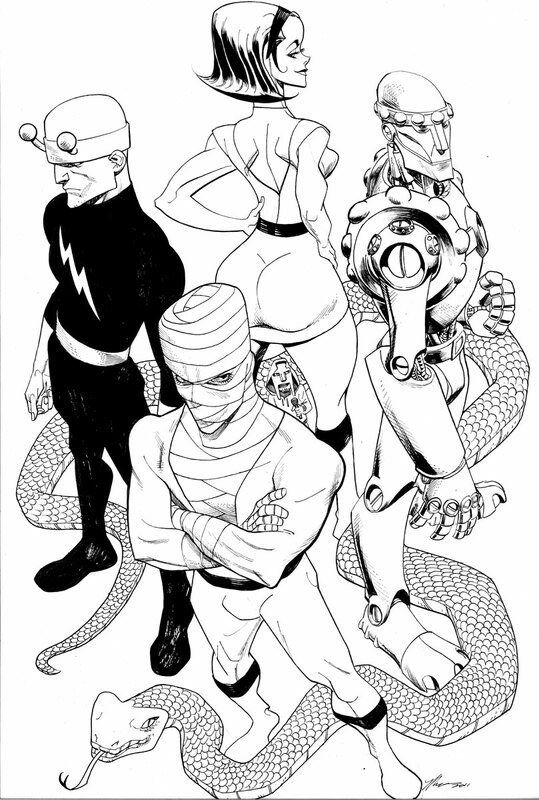 Here's some more Doc Shaner stuff to inspire you to make with the clicking above. Check out the almighty Twart to catch the vibe. This is one of the best pieces I've seen on the Twart, of the DP, and from Doc Shaner in particular. It's awesome in a can. I especially dig the chalk-like drawings of the villains in the background. Great, great stuff. 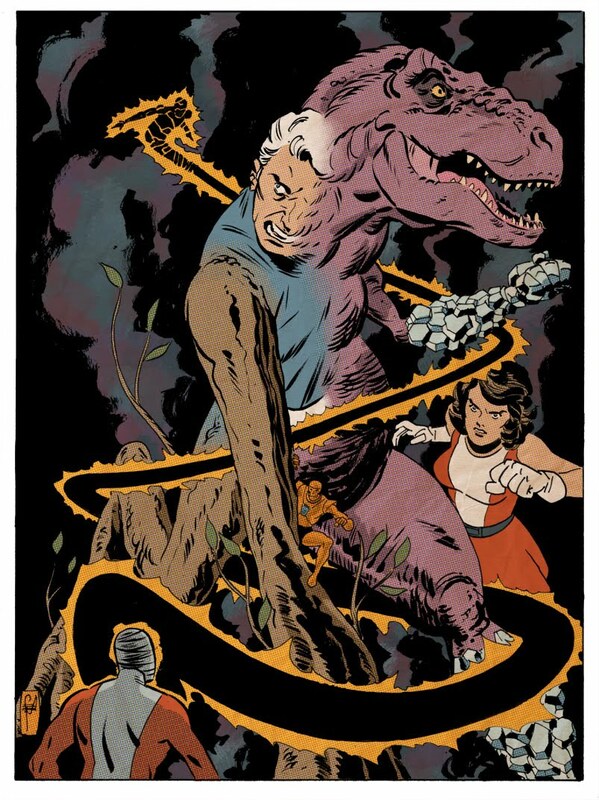 How Shaner doesn't have a regular gig somewhere drawing something is completely beyond me. 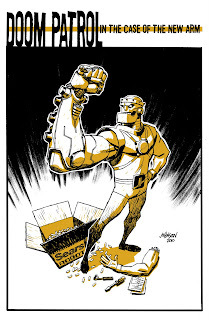 His style, to me, is timeless, in the way that Mike Parobeck's was. 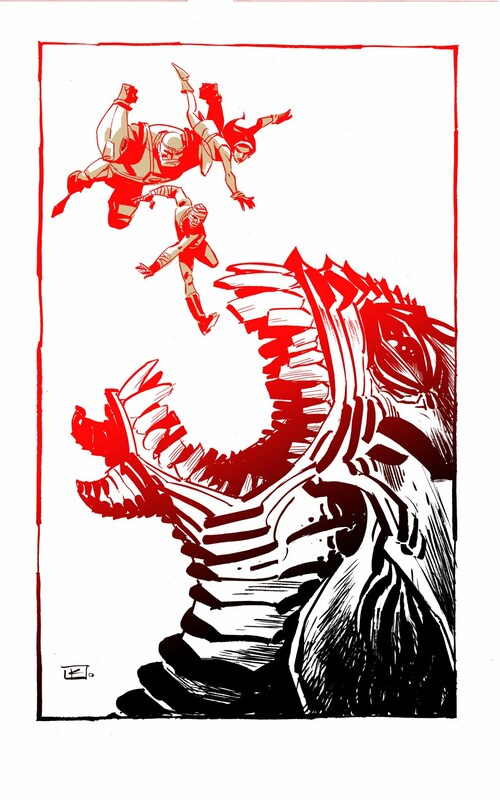 Check out more of Shaner's stuff. Thank me later. Quick side note: I do not know the entire selection process that went into Chris Samnee declaring that the Doom Patrol would be the Twart selection of the week, but I find it stunning to see that the majority of these entries tie in to the "classic" Doom Patrol, without a Negative Woman, Celsius, Tempest, or Dorothy Spinner to be seen yet. The colors are the first thing I noticed on this Twart piece. It's a simple gradient, red-to-black, but it is applied to the line art rather than the background, so it presents a different vibe altogether. Pretty sharp! This one's by Firebreather co-creator, Andy Kuhn. Kuhn's work, moreso than his fellow Twartists, tends to take the subject on from a wider angle. In this case, the DP are small compared to the beastie they're about to be consumed by. Looks like a fun tussle in the works. I'd like to see DP team up with Duncan, or at the very least make a journey over to Dinosaur Island. That's gotta be somewhere near Oolong, right? 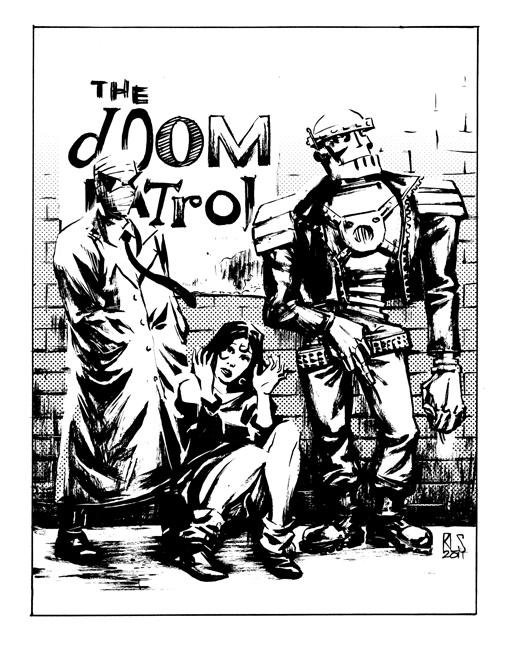 I don't know much about the Doom Patrol,but I always thought they were pretty cool characters. so that's something. Thanks for looking. 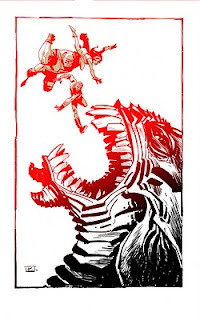 While we're talking Firebreather, I once interviewed Andy's co-creator on the book, Phil Hester, for Comicbloc.com. Among the questions I asked Phil was, "What's your 'holy grail' - what one thing do you have to do before leaving comics?" Phil's answer, "As a writer, the Fantastic Four and Doom Patrol. As an artist, Ragman or OMAC (the real one). The Question would be cool, too." Think about that and take another look at the image above. It's a balmy 40 degrees in Michigan as I type this, so thinking forward to May and sixty-degree weather sounds alright to me. Unfortunately, it looks like May isn't going to be any too kind to our favorite freaks. It’s all been building to this! 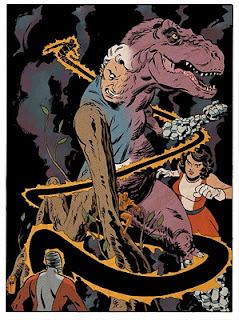 To retake Oolong Island, The Doom Patrol must face a pan-galactic array of foes, old and new alike. Hanging in the balance is the fate of the team, the island – and maybe even the world! The DP also make their presence known in this collection, reprinted yet again for your edification. Nuts. "It's all been building to this!" Seems to me like there might have been a little more waiting for us on the other side of issue #22, but sales are what drives this business. Hmmm. Maybe a groundswell of support could save the book similar to what Spider-Girl enjoyed so many times. . . Happy Monday friends! Happy Valentine's Day too! I wish I had some DP Valentines to send you all. Those could border on creepy, couldn't they? A card with Mento on it, or one with Crazy Jane. . . hmmmmm. . . .I think I might be on to something here. . .
At any rate, the Twartiness featuring the DP continues on. Mike Hawthorne, who I have to admit I am painfully unfamiliar with save for his Twart endeavors, has added this little piece. Mike's got some Conan, Star Trek, and Fear Agent experience, but I'm not a regular reader of any of those. Regardless, I thought it was a nice Negative Monday addition, as Larry is featured so prominently. Speaking of creepy, I'm not sure what's up with the fella holding the mic with the hoody and Dr. Doom-like mask, but there it is. Not too sure about the snake either, maybe that's supposed to be Gar? Let's pretend it is. At any rate, Mr. Hawthorne's DP looks pretty snazzy to me, I like the oddity of the tech Cliff is sporting here, and the bands around the tops of Larry's boots are a nice element that plays off his belt. More Twartiness still to come, my friends. Have a great Monday! More Twartiness from me to you. 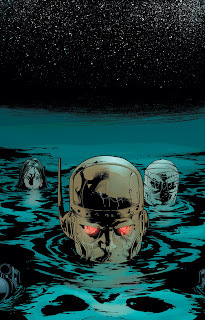 Declan Shalvey's had a go at the Thunderbolts recently, and here's his masterful piece of DP loving. Commentary and such are available here. I love the movie poster vibe radiating off on this one. Tom Fowler dropped an awesomeness bomb on the ComicTwart Doom Patrol goodness for the week. Check out the awesomeness and the comments via clicky. I've got to admit, I'm enamored with Heroclix, but I have absolutely no clue how to play the game. The figure assortment allows for molded bits of plastic featuring characters who otherwise don't exist in the round. It also features tons and tons of characters that saturate the market otherwise, but it's a nice additional niche for comic fans to dip their collecting toes into. I'll occassionally pick up a 'Clix (is that even proper slang?) 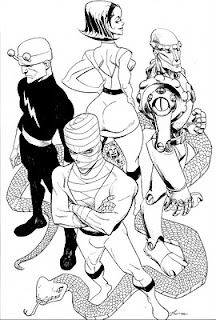 or two at shows, and have amassed a nice collection of characters I like, including most of the Doom Patrol. Since we started talking about the role playing games with Gar, I think we'll start a Heroclix investigation with Salad Head, from the DC 75th Anniversary Heroclix set coming out that it includes a wide array of Gar. 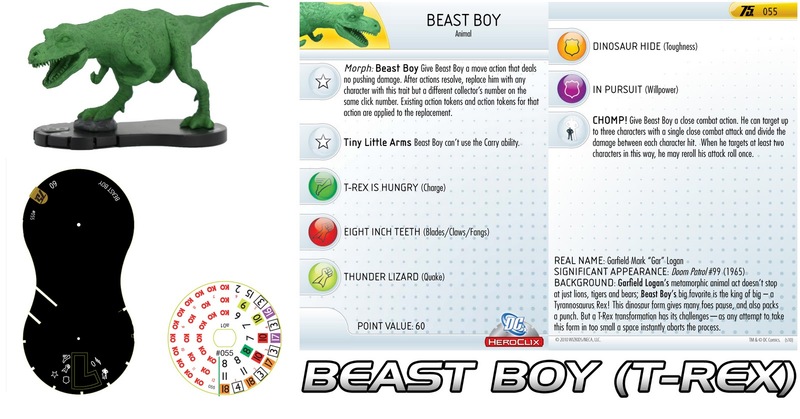 While I don't have any of these new Beast Boys, I'm certainly keen on expanding the set I do have with, at the very least, the T-Rex. How awesome is that? I have less than no clue how to play this game, but that doesn't stop me from recognizing coolness. Hopefully some other Doom Patrollers will get some love in this 75th Anniversary set. 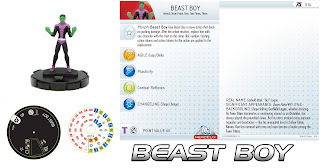 Here's a look at the first Gar Logan-related Heroclix, which branded the boy as "Changeling." 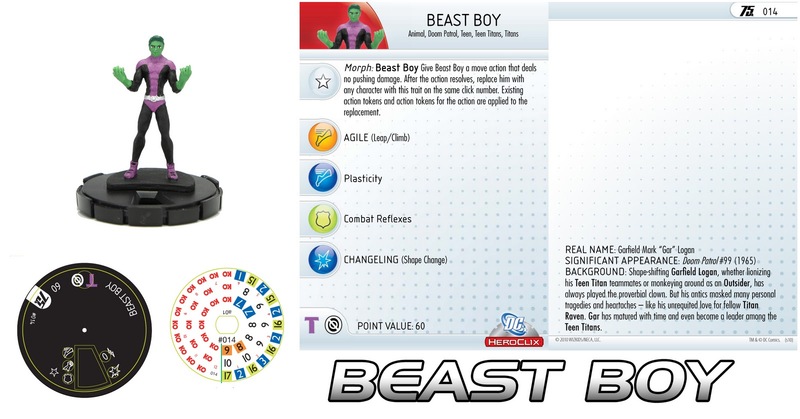 As I previously mentioned, I've got a pretty good cross-section of the DP, and it seems as though the Heroclix makers sought to make a cross-section rather than single out any one specific lineup. 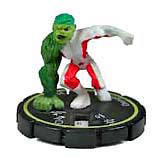 My Heroclix DP includes the Gar shown above, Elasti-Girl (sold as part of a Giants collection that included Chemo and Atom Smasher), Robotman, Mento, Chief, and Negative Woman. They'll all get a turn in the spotlight here eventually. Continuing my love affair with this week's topic over on the ComicTwart, here's the latest from over there. It's by Ron Salas and you can check out what he has to say about it, right here. Francesco Francavilla delivered his Doom Patrol Twart piece today, and I love it! I love it so much, I'm just going to tease it, just like Francesco did. If you're not reading Detective Comics right now, you're missing out on some great Francavilla art in the Commissioner Gordon backup. 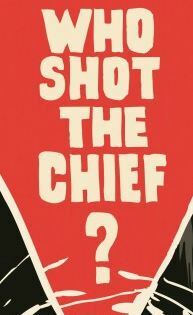 Francavilla will also be handling the art for an entire issue coming up soon. Scott Snyder, of American Vampire fame, is penning the work over in Detective. Do yourself a favor, Patrollers, check that stuff out. 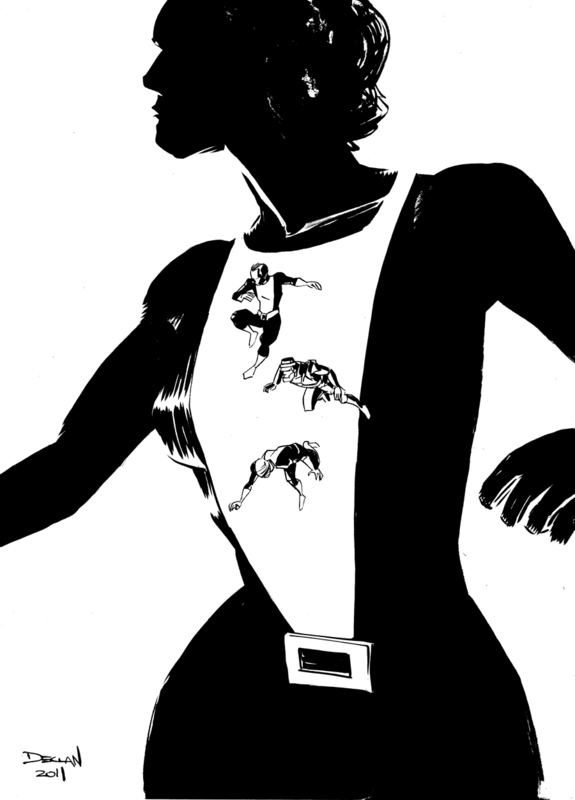 Francavilla's also working on Black Panther as well. This DP is from DP - Dan Panosian. I loved ComicTwart before, but this week has been something else entirely. Again, I point you to the Twart. I can empathize with Larry as he's depicted here. That's the way I certainly felt after the last time I had my car's oil changed. It's been a long, long time since I've posted, and I'm sorry. I've been very busy with work and busier still with extracurricular activities. But enough about me. Let's talk about Comic Twart. For those of you that have never dared to click through some of the links I house to the right here, you've missed out - completely - on Twart. It's a collective of artists who draw characters and tweet the drawings. The artists choose a character and go from there, with each submitting their drawing. Check out the Twart to see the list of artists and the characters they've rendered to this point. There are some wonderfully fun choices, and some headscratchers, but the end result is enjoyable art all the way around. 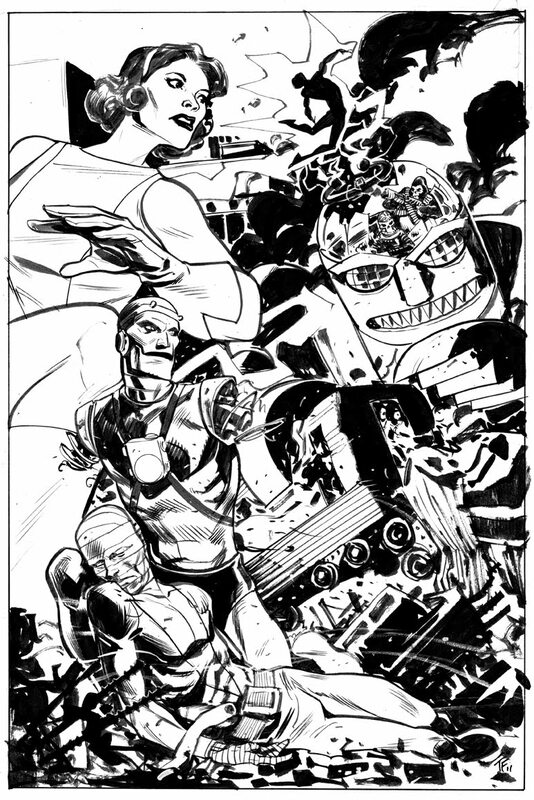 Wellllllllllllllllllll, this week, Chris Samnee (I'm told it rhymes with "omni") stepped up and chose the Doom Patrol. I'm a big-time Chris Samnee fan as it is. His stuff was amazingly good on Thor: The Mighty Avenger, and his style is unlike many others. 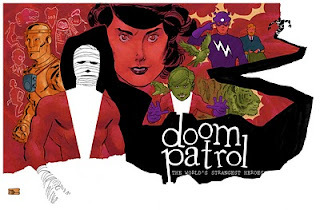 I've been patiently waiting to see what Chris does next, and given that he chose this week's topic, looks like he'll be doing THE DOOM PATROL! For a single drawing at least. Sorry, went all caps for the dramatic effect. At any rate, the Twartists have started submitting their DP drawings, beginning with the newest Twartist of all: Dave Johnson. 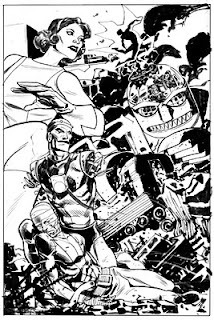 Johnson's no stranger to comics, but hasn't done much interior work of late (that I'm aware of, please let me know otherwise), opting for cover work. Naturally, he's a perfect match for the Twart. I'll share the image with you here, but please, do yourself a favor and check out the site yourself. You will not be disappointed. I like Johnson's work, especially his Freedom Fighters covers of late. Seeing him deliver Cliff Steele here is an amazing piece of work. Looks like it's going to be a good week.